Ever wish you had a personal mentor-mom who could give you a word of encouragement or practical advice? Let Marcia help you get organized with great tips and plenty of stories and encouragement in Managing Your Home from the Management for Moms Series. On sale now for just $3.99, or get a special price on the whole Management for Moms series here. Want a happy, economical, well-run home? I love my family to pieces but I fail in many areas when it comes to managing the home. This is a book that I wish was in soft cover. I would have highlights and notes scribbled everywhere! ~ In fact, I plan to send this ebook over to an office supply store to print and bind. I have no doubt that a happy, economical, and well-run home will be the result if even a fraction of her advice and tips are followed. Marcia is uplifting and encouraging as she shares her secrets to making a home run smoothly. I am thankful for the wise counsel Marcia has shared through Managing the Home. I am also excited and hopeful about implementing more of her practical tips in my own home. And this is what I love most about Marcia ~ she openly shares her failures and what she's learned through them to help us. This e-book is full of practical advice and examples straight from the Washburn household, along with many Biblical quotes and even devotional material of sorts. I consider this a true Titus 2 ministry she has developed and shared with us! I'm reading "Managing Your Home" which I recently bought in the Build Your Bundle sale. I'm an Australian homeschool mum with six kids aged 5 months to 12 years. House work is not my forte. I just wanted to thank you, because I've never read anything about home management that matches my experience. Other things I've read say things like "I lingered over my housework because it was more interesting and fulfilling than my book-writing" (you've got to be kidding) or "Now look, I really totally LOVE housework..." (you've got to be kidding) or "The best way to manage your life is to fill out this timetable which starts at 4am and finishes at midnight" (you've got to be kidding). It's really helpful to read something and say "Ah, me too. There's someone out there who gets it". You can take advice so much better from someone who shares a similar outlook/experience. So, thank you. Homeschool Mom of 3 Working Towards More Efficient Home Management! This book is filled with practical, easy-to-implement suggestions and wise, Biblical perspective. Marcia covers everything from schedules and routines to laundry sorting and car maintenance, while still speaking to our attitudes and the condition of our hearts! Marcia turns our eyes and hearts back to Jesus: His work ethic, His servant-heart, and ultimately His Kingship over everything that He allows us to steward. May we love like Him, work like Him, serve like Him, and, in the end, be found good stewards of all He has entrusted to our care! 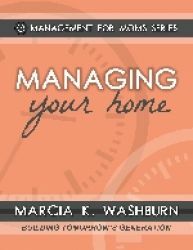 Thank you, Marcia, for such a comprehensive Home Management resource!